HCM City (VNA) – Facing the huge pressure of waste treatment, Ho Chi Minh City has been strongly inviting investment into waste-to-electricity technology so as to protect the environment and boost energy efficiency. Director of the municipal Department of Natural Resources and Environment Nguyen Toan Thang said more than 9,000 tonnes of solid waste are released in HCM City each day. About 76 percent of the volume is buried, 14.7 percent is recycled, and 9.3 percent is burned. The city is calling for investment in waste treatment using advanced technologies, especially waste-to-electricity one, so as to reduce the rate of buried waste to 50 percent in 2020 and 20 percent in 2050. Local authorities have permitted a project using plasma gasification technology to convert waste into electricity. The project, invested by the Trisun Green Energy Corporation, is able to handle 2,000 tonnes of waste per day when operational. In late 2016, the Thuy luc – May (hydraulic power – machinery) Co. Ltd was licensed to pilot the Go Cat waste-to-electricity factory. This plant was put into operation on March 30, 2017 and generated electricity to the national grid nearly one month later, on April 22. This factory has compressed 500 tonnes of non-toxic industrial waste into fuel cubes and converted 35 tonnes of waste into 7 million kWh of electricity. Its treatment cost is estimated at 1.5 million VND (64.8 USD) per tonnes while the power selling price is about 10.5 US cent per kWh. Director of the company Nguyen Gia Long said waste-to-energy factories can be built on small scale in communes and districts to help address local waste problems, thus reducing the transportation of waste from downtown areas to the outskirts for treatment. After the success of the Go Cat plant, his business is waiting for permission from the HCM City administration to take a step further in the direction. Accordingly, garbage will be compressed into cubes at the Phuoc Hiep waste treatment complex in Cu Chi district and then delivered to the Go Cat factory for power generation. The company envisions the production of 20MW of electricity from every 1,000 tonnes of solid waste each day. 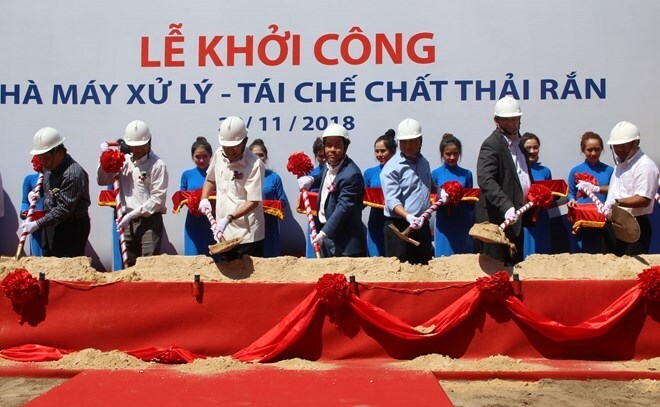 Meanwhile, on November 22, 2018, the Tasco JSC began the construction of a waste-to-electricity plant at the Tay Bac solid waste treatment complex in Cu Chi district. The factory, invested with nearly 1 trillion VND, is scheduled to become operational after 24 months and able to handle 500 tonnes of waste per day.